In case you’re not interested in the whole thing, here’s a short summary of 2015 and my plans for 2016. Then I’ll loop back into a deep dive of my 2015 results. When I quit my job, I was hoping to cover my monthly expenses with product revenue by the end of 2015. I’m not even close on that. I had planned to totally get Fearless Salary Negotiation and all related products and tools launched by the end of 2015. I’m not even close on that. I planned to re-focus on TaskBook starting in January 2016. I’m definitely not ready to do that. I didn’t achieve some of my 2015 goals, but that’s totally ok. In poker, there’s a saying that if you never get caught bluffing, you’re not bluffing enough. The same is true for setting goals: If you achieve every single goal you set, you’re probably not setting goals that are challenging enough. So I don’t see these as missed goals—they’re just goals I haven’t achieved yet. I’ve never done a year in review before because I usually blog the major events as I go. But I think it’s worth digging deeper into some of the things I’ve done this year because not only did I quit my job to pursue “side projects”, but I laid out my plan ahead of time and have some results I can share on the journey so far. With that in mind, here’s my plan for the first half of 2016. 2015 was a big year, but it was also just the beginning of my plan. I didn’t leave my job to self-publish a book and hit #1 in a couple categories on Amazon. I left my job to try to make a living by selling things I make. From that perspective, I’m barely getting started. The ROI for those who read my book is ridiculous. The testimonials (on the website or the back cover of the book), show that I’ve helped people get $3k, $7k, $10k, $15k more money than they would’ve gotten without my book. The lowest ROI for those testimonials on a $4 Kindle book is like 75,000% (not a typo). On the high end, the ROI is almost 375,000% (not a typo). But a book is tough to use in a pinch. The video courses will go deeper than the book and will be quicker than reading the book. I want to provide a good option for someone who realizes they have an interview tomorrow and they’re not sure how to maximize their salary, or they get an unexpected job offer and need a negotiation strategy right now. Video courses are much more expensive to produce and distribute, and their value is much greater because of the timeliness they offer. So I’ll have to charge a lot more for them than I do for the book. But even if the video courses cost 100x what the book costs, the ROI will still be 750% up to 3,750% in my examples above—still a great value. This one’s pretty straightforward: I should have an audiobook for those who want it. I’m learning how to do this now and want to get it done as soon as possible. I want to do a podcast, but I haven’t figured out exactly what I want to do. At first, I was thinking of just focusing on salary negotiation topics, but then I realized there isn’t much out there for 9-to-5 employees in general. I’m normally a big fan of finding a narrow niche, but I think this may be a case where going broader makes sense. There are so many people who like their 9-to-5 jobs, want to keep them for a long time and manage their careers effectively while getting paid what they’re worth. I can help with that. This is my dark horse candidate for “Thing that could steal the show in Josh’s 2016 recap”. I’m very, very early with this idea, but I’ve already gotten some very positive traction and there could be a tremendous opportunity here. My original plan was to jump back into TaskBook full-time in January. But I’ve still got so many things to do for Fearless Salary Negotiation that I don’t want to lose focus. As long as Fearless Salary Negotiation milestones keep passing and as long as I keep getting encouraging feedback with each new milestone, I think that’s where my focus should be. So the redesign-and-relaunch-TaskBook plan is still on the “future plans” list. That’s what’s on tap for the first half of 2016. 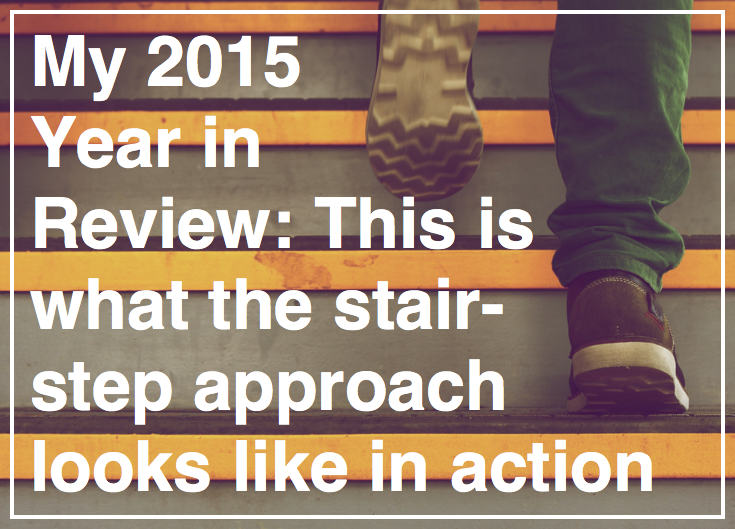 Let’s jump back into 2015 for a more thorough review. Before I dive in, I should say that my recap is not for the risk averse or faint of heart. This isn’t a glowing unicorn story about how I quit my job and now I’m RICH RICH RICH!! It’s the beginning of a story that continue into 2016 and beyond. It’s either the beginning of a story where I quit my job, toyed around with side projects until I ran out of cash and found another job, or it’s the beginning of a story about quitting my job to pursue The Stair-step Approach ™ to learn how to make and sell things people want to buy, eventually making a living from those things, and hopefully making a better living than I would have if I had continued on my established career trajectory. And that’s why I think it’s important that I write a recap this year. Too many of these annual recaps are written because the previous year or years were a success, and not just as a recap for recap’s sake. There’s a lot of survivor bias out there, and that bias encourages other people to do crazy things because they misperceive that survivor bias as a sampling of real world results. It’s not. In my case, I’m a pretty smart guy who carefully planned to transition to side projects by the end of 2015. I killed all of my debt with the exception of my mortgage, which is on a small house worth very little. I saved like crazy for about 15 months after I killed my debt. I reduced expenses, but not to the bone—I wanted to maximize my runway while allowing myself to enjoy my newfound freedom since I may never get a chance to do this again if I fail. I built and planned products so that I wouldn’t be starting from scratch when I finally made this jump. I had a plan to execute for the first 15 months after I quit my job. This wasn’t a decision I made on a whim, and I wasn’t hoping to get lucky. I say all that to emphasize this: If I fail—and odds are that I will fail—that will illustrate how hard this is (at least for me). It’s hard to carve out your own place, make your own products, and support yourself. It’s even harder to do that in a way that will exceed income from a full-time job leveraging years of education and experience in a strong industry. This is not easy. This will not be easy. Here’s how it’s gone so far. Right out of the gate, on January 5, I announced that I was writing a book. This tweet was a watershed—my first public announcement that I was writing a book I had planned for years. It was the first time I decided I would write my own book, without co-authors, without a publisher. I had several ideas for books, but all of them were dependent on one or more co-authors helping out. I was comfortable moving from traditionally published to self-published, but I wasn’t comfortable making the jump without co-authors. Why do you want a co-author in the first place? Also, what would your main goals be from publishing the book? BTW — you should do it! So the tweet above is a big deal. In six months, I went from looking for co-authors to writing a chapter, picking a title, and publicly announcing that I was writing a book. I even had a landing page and everything. I initially planned to write “a career management guide” as a playbook for people to stand out among their peers so they could move faster and get better results. The first chapter was “How to impress your boss with awesome email”, and I planned to write about meeting etiquette, how to get promoted and that sort of thing. I hoped to launch the book in July. Now that I had a book and a launch window in mind, I needed to start building an email list. I had heard that building a mailing list was the best way to grow an audience, but I didn’t believe I could build a meaningful list. Still, I had to try because all the self-publishers I knew also had a list. First, I tried MailChimp, but found it frustrating to work with. So I signed up for ConvertKit, made a landing page and parked it on my site. This was a great decision that helped me avoid a lot of frustration throughout the year. I recognized every one of my 15 subscribers—all family and friends. I think that’s pretty common. Most of them probably didn’t even read the chapter they got for signing up. My goal was to get to 1,000 subscribers before I launched my book. In early April, I recorded my first podcast interview with Justin Jackson. I am a member of Justin’s Product People Club, and he wanted to know more about how I found the group and what I got out of it. This interview is a snapshot of what I was thinking in early April 2015. At the time, I was writing “Take Control of Your Career” and hoping to launch in July. My plan was to try to get to 1,000 newsletter subscribers and sell the book through Gumroad for $39 and up. I was hoping for a $10k launch, meaning I hoped to sell $10,000 in revenue on launch day. So that’s my first public benchmark for what would later become Fearless Salary Negotiation. Justin asked me what I hoped to write about if I published a 2015 recap next January. I told him I would write about getting to 1,000 newsletter subscribers and executing a $10k launch. I didn’t hit either of those goals because I changed them later on. Once I wrote the “How to get your next promotion” chapter, I realized it would make a great email course just because of the way it was structured. It had several clearly-defined phases, each about the right amount of information for a medium-length lesson. Nathan Barry and Jeff Goins both talk a lot about how email courses are great for finding an audience, so I decided to give it a shot. Next thing I knew, I had “How to get promoted in 7 days” ready to go. I beta tested it with five or 10 people to get their feedback on the course. That was a great move because it was a much better course when I incorporated their feedback. Before I could launch it, MicroConf 2015 happened. I started making my own things in 2011, but I mostly worked in isolation. It took a few years of convincing (thanks Jesse and Ryan), but I finally went to my first conference—BaconBizConf—in 2014. I almost went to MicroConf in 2014, but didn’t make it. So I was pretty excited to finally get to MicroConf in April of 2015. MicroConf 2015 was only my second conference, but I already had a strategy for maximizing my time and money spent: Focus on a single project and try to talk to at least two people who are experts in that domain. At BaconBizConf 2014, I was totally focused on TaskBook, so I talked to several SaaS software experts that helped me clarify my vision for the product and its future. At MicroConf 2015, I was totally focused on writing my career management guide, so I wanted to talk to domain experts in that area. I mostly wanted to talk to Josh Kaufman, who I met at BaconBizConf 2014. Josh wrote The Personal MBA, which has done extremely well over the past several years. It’s a business book, and I was writing a business book, so it seemed logical that I should talk to him. As luck would have it (wink wink), I sat next to Josh at the first session of the conference. We were unable to talk then, but I made sure to set up an informal time to talk later. Before I talk about how I changed course thanks to Josh’s advice, I should tell you about what my original plan was. I am really clear on this because I talked to Justin Jackson about it for 30 minutes and we recorded it on Soundcloud. My plan was to totally self-publish and self-distribute via Gumroad, offering multiple packages at different price points. All that changed once I caught up with Josh at a group dinner one night. All I really wanted to do was tell Josh what I was up to and see what he thought: What other chapters did I need? Was my price reasonable? What else should I include with the various packages to add value to the book? But the first thing he said was, “Ok, let’s talk about your publishing strategy.” He was thinking much bigger than I was. By the time we finished talking, I had a new book title and sub-title, a more specific subject, and a completely different distribution and pricing model. All of it was written on a single 3×5 notecard that Josh gave me to take notes. As it turned out, Tim Grahl was at dinner, too. Tim specializes in helping authors hit #1 on Amazon. He wrote Your First 1000 Copies and created the free Hacking Amazon course. So Josh introduced us and I added some things to my reading list. So a $10k launch suddenly became a longer-term goal. My new goal was launch Fearless Salary Negotiation as a #1 Best Seller in at least one category on Amazon. This sounds like it was a pretty change—it was not. I think it took me about three more months to let go of the $10k launch goal and commit to releasing the book exclusively on Amazon. The second person I wanted to talk to was Patrick McKenzie. I met Patrick a couple years earlier when he took the time to give me his feedback on an early version of TaskBook. It’s hard to overstate how much his blog post on salary negotiation has influenced my thinking on career management. I have read, used, and shared that article many times. Just before MicroConf, I wrote a draft of the “How to negotiate your new salary” of Fearless Salary Negotiation and I wanted to know what he thought. I only got to talk to him for a few minutes, but our short chat was really valuable. He was enthusiastic about the subject and encouraged me to pursue it aggressively. I could tell he was happy to see someone writing about it. He also encouraged me to think more about courses and other ways of delivering my content to people. I mentioned my “How to get promoted in 7 days” email course, and he suggested I do something similar for salary negotiations. That got me thinking about video courses, which I’m currently working on. I also had one unexpected takeaway from David Kadavy‘s attendee talk at MicroConf: I should launch “How to get promoted in 7 days” as a big event on a specific date rather than just sort of opening it up and telling people about it. This helped “How to get promoted in 7 days” get off to a good start, but it was also great practice for a multi-faceted, planned launch like I would need to get Fearless Salary Negotiation to #1 Best Seller status on Amazon. So MicroConf 2015 was a big success. I came home with a whole new strategy and focus. Now I just had to execute. Earlier, I mentioned that I built “How to get promoted in 7 days“—my first email course—but didn’t launch it because it was in beta when I went to MicroConf. The plan was to improve the course based on beta testers’ feedback and launch it as soon as I returned from MicroConf. But thanks to David Kadavy’s talk, I decided to delay the launch so I could create a launch event. Full disclosure: I have no idea if more people took the course because of the big event-style launch or not. Before the launch, I had about 150 email subscribers. A little over 200 people signed up for the course when it launched, so I jumped from 150 subscribers to more than 350 subscribers thanks to the course. But even more important was that I had created, promoted, and launched a quality product that people were interested in. Yes, it was a free product, but it was a product nonetheless. As of this writing, about 425 people have taken “How to get promoted in 7 days”. As a quick aside, I should note that launching “How to get promoted in 7 days” gave me some perspective on how intense product launches are. I relied pretty heavily on Buffer and other things to help automate as much as possible, and still found all of my free time consumed in the week on either side of the launch. If launching a free email course was this intense, what would it be like to launch a book? Just before I launched “How to get promoted in 7 days“, I decided to write about the experience. At first, I thought it would be a medium-length blog post about being afraid to launch stuff. But then it morphed into an ongoing account of what it was like to launch my first email course, including goals and results. I won’t rehash all that here, but it could be helpful for anyone who is in that state where you have a product ready to launch and you just can’t hit the “Go” button. This brings us to late May. After a month focusing on the email course launch, I needed to refocus and finish writing the book. The good news was I had significantly narrowed the scope of the book after my talk with Josh. Rather than “a career management guide”, I was writing “a step-by-step guide to getting paid what you’re worth”, so I wouldn’t need to write as many chapters as I had planned. But I had to rewrite a few of the chapters to dive deeper. By the time the book was finished, I did three full rewrites of “How to negotiate your new salary”—I wanted to get it right. The book cover was the one area Josh suggested I invest some money to work with a professional. I went through several iterations with Pete Garceau and I am very pleased with the result. This was the greatest expense when creating the book, by far (excluding the value of my time, of course). I also spent some money to have the book professionally edited. I had a great experience with the editor for my first book, and I was able to track her down for this book as well. It’s hard to overstate the value of a good editor. Writing and editing are two different skills, and she is a much better editor than I am. Now I had an edited version of my manuscript with a nice cover and a detailed plan. Time to launch, right? Well, no. But I did start sending out review copies of the book so I could get some feedback and so I would hopefully get some early reviews on launch day. By the time I launched, I sent out about 50 review copies. Let me explain. Remember when I started building my email list for Fearless Salary Negotiation and I gave away a free chapter called “How to impress your boss with awesome email”? Well, once I narrowed the scope of the book, a chapter on writing better business email didn’t really fit anymore. So what to do? Well, I could just include it in the back of the book as an appendix. After all, most of the chapters in the book have sample emails that are written using the principles from that chapter. But since I planned to publish Fearless Salary Negotiation as a paperback, including an extra 40-page chapter would be pretty expensive. I had to pull it from the book. One day, while I was waiting for the edited manuscript, I had an idea: What if I published that email chapter as a short eBook? Not only would it be nice to get something out of all that work, but it would be great practice for self-publishing Fearless Salary Negotiation later on. I would have to learn how to make an eBook and how to format for various readers. Why not figure that out before I launched the book I had been writing all year? So I jumped back into the email chapter, added to it, rearranged it, and turned it into Mastering Business Email—my first self-published book. Ok, so I’m going to launch this book now, right? In September, I quit my job to fly solo. September 21 was my first day working for myself full-time. Even writing that paragraph makes me feel a little anxious, but I still think it was the right thing to do. A big reason I had to quit my day job was that I couldn’t see any way to launch my book and see where that led while working full time. Writing a book is something that can be done in a leisurely way, as time allows. And I think it’s totally reasonable to write a very good book while working full-time. Nights and weekends, an hour here and three hours there is sufficient to write a good book. But to launch a book requires focus and I didn’t think I could give it my best shot while I had a job. I was also looking ahead at my other plans for Fearless Salary Negotiation—video courses, consulting—and that just wasn’t going to be possible if I was working full time. So I ran up against a sort of fork in the road: Keep my comfortable day job working at a great company with a great team, making a good living or go all out to launch the book and see if I could create video courses and do some consulting. Once the book was written and ready to publish, I could either do a tepid launch and back burner the other ideas indefinitely, or I could go all-in. I had been aggressively saving up money for over a year, and I did that specifically to give myself full control over this type of decision. Saving money and paying down debt is liberating, and I finally got to see exactly how liberating it could be. This decision was mine to make based on the merits of the opportunities in front of me. I could compare the benefits of my day job with the opportunity costs and decide whether or not to take a shot. Part of my planning was that I now had two books written, and one was ready to launch. Mastering Business Email was complete and all I had to do was upload the files and hit the magic “sell” button. Fearless Salary Negotiation had been edited and was nearly complete. Now it was time to launch my first self-published book. I launched Mastering Business Email on October 1, after about two days of planning and final prep. This was eBook-only, which meant no need to mess with paperback formatting. I sold a few copies and packages, but the book basically flopped. At the time, I think I knew that would happen, and in hindsight, that’s pretty much the only outcome that makes sense. But this was a good thing because it was a strong reminder that writing books is hard, but launching them properly is harder. I still learned a lot from launching Mastering Business Email. For one thing, I learned how to create and publish three different eBook formats (PDF, mobi, ePub). eBooks have been increasingly popular over the past decade, but creating then is still very primitive. I basically had to assemble my own tech stack to publish this book, and it was much more difficult than I anticipated. If I hadn’t learned this with Mastering Business Email it would’ve been much harder to publish Fearless Salary Negotiation. For one thing, I did almost no marketing or promotion because I launched it on a whim. I had the foresight to realize that learning how to self-publish was important, but not enough foresight to also use this as an opportunity to work on pre-launch marketing and buzz-building. Oops. I didn’t validate the idea at all. I didn’t test it to see if people were interested in it and, more specifically, if they were interested enough to pay for it. I did a surprise launch. As soon as I finished laying out the book and building the extra materials, I just launched it. I didn’t offer a pre-order or anything like that. I just suddenly emailed my newsletter and announced it on Twitter. That’s no way to sell a book. So why did I do that if I knew better? For one thing, I had quit my job to publish books and work on other projects. I felt like I needed to demonstrate—to myself and to those who know me—that I was making progress to justify that decision. What better way to demonstrate progress than to publish a book two weeks after I quit my job? I was also looking ahead to the main event for 2015: Launching Fearless Salary Negotiation. I decided that publishing and launching Mastering Business Email first would be good practice, but I wanted to publish Fearless Salary Negotiation as soon as possible. A huge takeaway from this book was that I created it from scratch, totally self-published it, and people bought it. Zooming out, I can see the stair-step approach at work. For nine months, I gave things away—free chapters, an email course, articles I wrote, my time to help people with salary negotiations—but this was the first time I sold content instead of giving it away. And some people bought it! Not many, but some. Selling things is hard. But I had now sold software (TaskBook) and a book. That’s progress. I also wrote an email course to teach the basics of Mastering Business Email in weekly lessons—I called it “Email 101“. This was another way of teaching the concepts in Mastering Business Email in a different format and offering the basics for free. I probably should’ve done this before I launched Mastering Business Email, but I didn’t have the idea until after the book launch. I launched it on October 14 (less than a month after quitting my job). As of this writing, about 125 people have taken “Email 101”. Only a few of those students actually purchased the book. This was also the first time I actually “hunted” something on Product Hunt: Email 101 on Product Hunt. A small thing, but this experience would be useful later for my Fearless Salary Negotiation launch. So, I published a book and launched an email course less than a month after quitting my job. Progress! When I launched “Email 101“, I had around 500 newsletter subscribers. Most of those were from “How to get promoted and 7 days” and the rest were from free chapter downloads. Going from zero to 500 subscribers in about 9 months wasn’t bad at all. Not amazing, but not bad. Part of growing my list was making sure to keep them posted on my progress with the book while also providing value so they could see that I know what I’m talking about. But every time I sent them a message, some people would unsubscribe (this is common). So growing an email list requires a steady stream of new subscribers that is greater than the number of people who unsubscribe over time. I struggled with this problem all year. I would launch a new email course or offer a free chapter download and get a bunch of new subscribers, but then they would slowly dwindle away with each email I sent out. This was actually a good thing because it helped ensure that the people who stuck around were really interested in what I had to say. But it was challenging because it made it harder and harder to hit that 1,000-subscriber goal I had. So I picked the first couple questions, wrote good answers based on my book, and included a link to download the full chapter to learn more on the topic. Right away, people started trickling in to my site, and a few subscribed to my newsletter and downloaded the free chapter. It was a perfect match because people were actively looking for answers that I had already written, and if they needed answers to those particular questions, then my book would almost certainly answer other questions they would have later. I decided to do an experiment: I would answer at least one question every day for a month and see what happened. I answered about 35 questions, had over 60k views on my answers, and got about 125 new subscribers. I had found a reliable way to reach new people and keep growing toward 1,000 subscribers even as other people unsubscribed and I felt really good about it. All the work I had put into writing my book was helping literally tens of thousands of Quora readers I had never met. I also had something else pretty significant: validation that I was writing about something a lot of people needed and cared about. It’s subtle, but the process for Quora readers to join my mailing list was different than any other avenue I had pursued. These people had specifically asked questions that I answered for them. And many of them found my answers useful enough that they wanted to read the full chapter and they joined my mailing list. I also found that my answers were often much different than the other answers to the same questions, and I felt my answers were often better thought out and higher quality. These were encouraging signs that I was writing a book that people needed and would hopefully pay for. Once I opened up “Email 101”, it was time to turn from Mastering Business Email to focus full-time on finishing and launching Fearless Salary Negotiation. As I mentioned earlier, my ultimate goal was to launch the book on Amazon and to hit #1 in at least one category. It’s important to note there’s no “getting close” to this goal—I either hit it or don’t. If I hit #2 in a bunch of categories, that would be virtually worthless. It would mean I sold some copies of the book, but I wouldn’t get the residual bump I was looking for. The benefit if hitting #1 in a category on Amazon is that I could forever claim to be a “#1 Best Seller on Amazon”. Nobody ever talks about (or cares about) hitting #2. I wanted to launch in early December in time to get some holiday sales. I reached out to my cover designer for a lead-time on the final paperback cover, and he said he needed about two weeks because I chose a very busy time of year. Oops. I suddenly found myself in a bit of a time crunch because I couldn’t send him what he needed to do the final cover until I had finished the paperback layout. And I still hadn’t even started laying out the paperback and in fact had absolutely no idea how to do that. So I went into sprint mode. Using the feedback I got from early reviewers, I tweaked the book, then went about porting it into the eBook and paperback formats. The eBook was easy, but the paperback layout and format was a bear. It took me four or five long days to create the paperback manuscript so that I could send the cover designer what he needed. Once he got the cover back to me (turnaround was much better than two weeks), I ordered proofs so I could identify any typos, make sure the cover looked good in print, etc. I figured I would need a couple days to go through the book and make a few tweaks before I would have the final version ready to go. What I didn’t anticipate was that holding a physical copy of the book and carefully reading it after a few months away gave me a new perspective. I did a full rewrite of the book, changing the structure, moving chapters around, editing it, etc. It took me a solid week of long days. To make things worse, I now had four versions of the book that needed updating: PDF, ePub, mobi, paperback. The process was tedious, to say the least. I finished some time around December 1, a week before the planned launch date. Initially, I expected to open up pre-orders a week out, but I backed off at the last minute. I read up and reached out to some friends, who told me that pre-orders don’t count toward launch-day stats on Amazon. Since my strategy was to try to launch to #1 in at least one category, it would be bad to dilute my launch-day stats by opening it up for pre-order. Instead, I focused on finishing up and so that when I announced the book on December 8, everything would be in order. This was an excellent decision that may have saved me from accidentally ruining my launch. Having narrowly avoided the pre-order mistake and taken a full week to prepare for launch, I was ready to go. On launch day I had about 700 newsletter subscribers—600 for things related directly to my newsletter and Fearless Salary Negotiation, and 100 or so that found me via Mastering Business Email. Early reviews are important because they’re a signal to potential buyers that the book is legit and worth checking out. From what I’ve read (and this mirrors my personal experience), there are some psychological milestones that give people an indication of how important a book is: 1, 10 25, 50, 100 reviews are all a quantum step up in legitimacy. For example, I frequently look for products on Amazon and I tend to ignore products that have no reviews. So there’s a big jump in credibility from zero reviews to one review. Going from one review to 10 reviews has a similar bump because that little number moves into double digits. So, in order to hopefully get some launch-day reviews for the book, I shared it with about 50 people beginning in July. The idea was to give them enough time to read it before the launch so that at least a few of them would leave reviews on launch day. My pie-in-the-sky goal was 25 launch-day reviews. That was an absurd goal, but why not try? I emailed the reviewers every few weeks leading up to the launch, then let them know when I was one week out, one day out, and when the launch was under way. I also sent one last reminder in the evening on launch day. Fearless Salary Negotiation had 12 reviews on launch day, so I got about half way to my goal. I also reached out to about 20 influencers that I know in several different industries. These are mostly people with thousands up to hundreds thousands of followers on Twitter and elsewhere. I sent them an email a week before the launch asking if they would mind telling their followers about my book on launch day. I also offered to share a copy of the book with them if they didn’t already have one. Almost all of them shared the book on launch day, which was unexpected. I think it was really helpful to have them all tweeting about the book on launch day and it definitely helped sales. I’m also lumping Product Hunt in with “influencers”. I posted Fearless Salary Negotiation on Product Hunt very early in the day and I think this drove about half of all launch day traffic. And there’s my mailing list. All year I had been letting my list know that the book was coming, and I started sharing more details in November. A week out, I gave everyone a heads-up that the book was coming and that I would offer an exclusive launch-day bonus to subscribers who bought the book. I emailed a week out, a day out, morning of, and one last time the evening of launch day. This was the single biggest driver of sales (as expected). Earlier this year, my launch goal was revenue based—I wanted to launch with $10k in sales. But once I changed my plan to launch on Amazon, my goal became rankings-based: Get to #1 in at least one category on Amazon. The bottom line is the launch exceeded my expectations. I hoped to hit #1 in a category, but I wasn’t holding my breath. Hitting #1 in pretty hard and involves a combination of skill and luck. But hitting #1 in two categories totally blew my expectations out of the water. I hadn’t even considered that possibility before the launch. I also ended the day with 12 reviews, which was a pretty good result. Revenue was tiny—something like $300. At first, I was a little disappointed in that, but it kind of doesn’t matter. When I originally set my goal of a $10k launched, I assumed I would be totally self-publishing, and that I would be offering video courses and other tools as part of several pricing tiers. My plan was to set the base price at $39, and to offer other packages at higher price points. What I actually did was sell the book only, distributed through Amazon at a lower price point. The video courses and other things will come later and will be priced much higher than the book. So I only launched a small piece of what I originally intended to launch. I did this because I was convinced that ranking well on Amazon would be better in the long-term than having a high-revenue launch. I’m still convinced this was the correct decision and by the metrics used to evaluate an Amazon launch, I hit a home run. I promised my newsletter a free bonus if they bought the book on launch day, so I had to finish those up and send them out. The bonus was three case studies I wrote about people I helped with salary negotiations in 2015. Throughout Fearless Salary Negotiation, I point to the free “extras” that readers can download to facilitate better application of what they learn from the book. These are things like email templates and worksheets. I finished them up and made them available for download. It took about a week to get both of those finished. The case studies were about 3,000 words, and there were several different “extras”, including a multi-tab salary negotiation worksheet that took a while to build. The last thing I’m doing in 2015 is writing down the things that I’ll forget if I wait any longer. You’re reading one of them. To use Gary Vaynerchuck‘s lingo, I’ve thrown a lot of right hooks this year, so I’m taking the final couple of weeks to write some really, really strong jabs to balance things out. This is really long, but I think there’s a lot of good stuff in here for a lot of people. If you know someone who might find this useful, please share it with them. And if you have any questions or want more information on anything I wrote about here, find me on twitter @JoshDoody.